That's the conclusion of a new nutritional study by researchers at Cornell University. They conducted a survey of 25 working mothers and 25 working fathers in low-to-moderate-income communities and found that more than half of the participants routinely resorted to unhealthy eating options because of their work circumstances. Carol Devine, the lead author of the study, which was published in the Journal of Nutrition Education and Behavior, launched the analysis after a 2006 study that she had conducted revealed that participants' work schedules were a primary obstacle to better nutritional habits. "Working parents are really busy people," she says. "We wanted to delve into this group and figure out what it was about their jobs that might influence the food strategies they used." The earlier survey identified 22 "coping" strategies that parents resorted to when they couldn't sit down with their families to eat a meal that was prepared at home. These included skipping meals altogether, eating at work, eating in the car, ordering take-out on the way home from work, choosing easy and quick-fix meals to serve or overeating after a missed meal. The 69 low-income wage earners in the first study admitted to skipping meals or not eating at home because of time constraints and for financial reasons  some chose not to clock out at work and give up wages for a lunch break. In the current study, Devine found that half of the mothers and fathers surveyed depended on 12 of the 22 mealtime coping strategies. Fathers tended to skip family meals, eat at work or feed their families take-out meals; mothers were likely to skip breakfast and buy restaurant or prepared entrees instead of cooking. 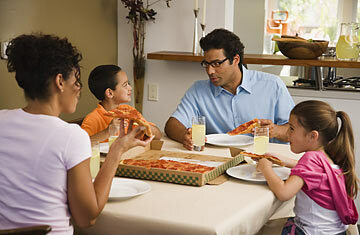 "We know that when people eat together as a family, diets of both the parents and the children tend to be better. But often our jobs don't allow us to eat together at home as often as we'd like," says Devine. "This is more common than we expected, and it's not just fast food." The issue is not simply a matter of what we eat, but how we eat. Long and irregular work hours are a primary cause of unhealthy eating habits, and while scheduling issues can't always be avoided, there are certain workplace-based interventions that could improve the diets of many wage-earning workers. Shift employees, for example, often resort to munching from vending machines because their employers' cafeterias are closed during off hours; keeping cafeterias open longer during off-hours could help workers to eat healthier. Having breaks to ensure that employees eat regularly would be another helpful intervention. Devine hopes that by quantifying the nutritional impact of on-the-job constraints, it might finally prompt employers to make some workplace changes. "We are not going to fix the obesity epidemic simply by telling people to eat well and choose good food," she says. "This study is telling us that it is the structure of our lives that makes it very difficult to do what doctors recommend." See 10 notable diet books of 2008. See the science of appetite.